Abdominal exercise machine SL106Outdoor exercise equipment reveals a new direction in working out w..
Abdominal muscles exercise machine SE140Exercise equipment for outdoor activities opens a new direc..
Abs exercises support SL125Outdoor trainer exercises abdominal muscles.THE TRAINER CONSISTS OF: GAL..
Adductor - Abductor exercise machine SE142The simulator trains the inner and outer thighs, strength.. Outdoor trainer - For arm exercises above headDesigned for bust, arm and should.. Outdoor exercisers are the sports equipment for a workout in the fresh air which reveal a new direct.. 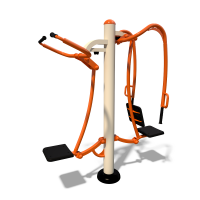 Chest Press - Lat Pull Down SE101-102Exercise equipment for outdoor activities opens a new directio.. Double Chest Press SE101Outdoor exercise equipment reveals a new direction in working out with weig.. Double Lat Pull Down SE102Outdoor exercise equipment reveals a new direction in working out with wei.. Double Parallel Bars SL105Outdoor exercise equipment reveals a new direction in working out with we.. Double Pendulum trainer SE104Outdoor exercise equipment reveals a new direction in working out with..
Ergonomic abs exerciser SL106.1Exercise equipment for outdoor activities opens a new direction in o.. Chest Press SE103Outdoor exercise equipment reveals a new direction in working out with weights for..
Orbitrek SE116Outdoor exercise equipment reveals a new direction in working out with weights for peo.. Outdoor rower SE 135 Outdoor trainer for rowing imitation exercises arms, shoulders, bust, stoma.. Trains and develops shoulders, bust and back muscles. Fixes posture and improves body shape. Intende.. Outdoor trainer "Skiier" SE141-TOutdoor exercise equipment reveals a new direction in working out w.. Outdoor trainer for arms SL118Trains and develops shoulders, bust and back muscles. Fixes posture an..
Pendulum - twister SL104.1This outdoor trainer is suitable for persons with different gender, age an.. Pull up Bar SL117Outdoor exercise equipment reveals a new direction in working out with weights for..
Scalpular waist exercise machine SE107Exercise equipment for outdoor activities opens a new directi..
Scapular waist exercise machine SE108Exercise equipment for outdoor activities opens a new directio..
Stepper - Thigh Extension SE126-136The exerciser allows you to effectively develop the quadriceps o..
Stepper SE136The exerciser allows you to effectively develop the quadriceps of the thigh and as wel..
Thigh extension SE126The exerciser allows you to effectively develop the quadriceps muscle of the t..
Trainer "Hyperextension" SL134 Trains back, buttocks and hip joints. Weight - 4..
Twister SE114Outdoor exercise equipment reveals a new direction in working out with weights for peo..